Gears - I had seen some gear related stuff and thought it was cool, but I didn't even realize there was a Steampunk movement, I just like gears. Plus I have a circle obsession, so moving from circles to gears, well that was a no brainer for me. 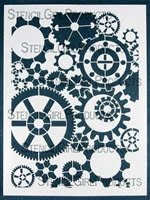 I had lots of rusty gear parts, I traced them, enlarged, played, embellished, varied the sizes. Over and over again. I didn't own a light box so I had gears taped to the window and traced them that way or did rubbings. I drew each gear on its own before I made the composition. Hand drawn and colored as I didn't know any other way. Greek Key - I had the need for a decorative stencil, something I could use to add borders, symmetry to my work, frame up certain sections, that kind of thing. Couldn't find anything in the store, (think 2010 and borders of ducks populating the craft store aisles). I have always admired the Greek Key design and actually hand cut this one too, it wasn't pretty, The entire design literally fell apart at one point until I got the bridges right. It took me forever and as I look back, I think I must have had an out of body experience. Rafters - my friend Greg Barth, a professional photographer, had taken a photo that I just loved, it was the inside of a barn, specifically, rafters. We were involved in a retail endeavor back in those years, had a store in a mall (yeah, that's a story for another day) and I used to stare at this photo when I worked in the store. Started making some sketches, refining shapes to my own needs. This one was hand cut too. My first book has a picture of the hand cut stencil on page 50. I still have it. Greg teases me about copyright. At least I think he is teasing. River Rocks - I collect rocks. It is an odd hobby for an adult woman. My husband often laughs because (if we are traveling by air), I could garner an overweight luggage charge due to rock collecting. When we do laundry, rocks fall out of my pockets. 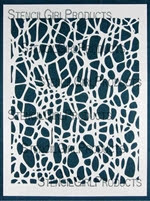 This design plagued me for years, I kept drawing it over and over, I painted several pieces with versions of the design, then ultimately cut it into a stencil. By hand. And then there was the day day I decided to paint something similar on the wall of our guest bathroom. Trees - were a personal mission. 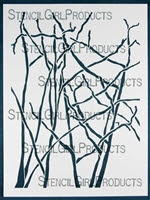 I wanted/needed a stencil of trees to use in my work but I wanted the positive space to be the tree limbs, not the negative space like all the other tree stencils back then. I started with photographs I had taken of trees. Took me forever to achieve the look I had in mind, delicate and natural. Drawing bridges in such a way so you would hardly even notice their presence was important to me. To this day, I love this stencil. I will often flip it back and forth to get a variation on branches. Web - I have saved the best story for last. I wanted the Web itself to be the positive space, meaning it would be an organic linear design. I drew my heart out, sent the design to be cut and it came back like this - the black parts are where the paint ends up, not the white parts like I had envisioned. Duh, big time brain fart, it would be darn near impossible to do it any other way due to the intricacy. Bridging wouldn't work. I was so disappointed and felt impossibly stupid I mean I paid a LOT of money for 100 stencils that were the exact the invert of what I had intended. After I slapped myself in the head, I decided to try it out and voila, I ended up liking it quite a bit. 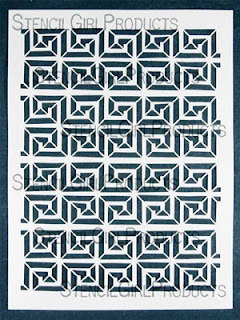 This stencil was my first great 'integrator' that being a stencil that will do wonders for integrating. Not to mention really cool texture. So that, boys and girls, is the story behind the 'Original Six' stencils. Loved hearing the background story. So cool. So glad you took that chance! Thank you so much, Dee! Hard to believe where we are today, ha! Life is good. Loved hearing this story! Thanks for sharing MB. As they used to say in those (yuck) cigarette commercials, you've come a long way, baby! Love your stories (and stencils)! How fun that you love rocks as I do; I carry them home all the time and have bowls of them all over my home. Living in seaside New England I've also built rock walls, edged gardens, tiled bathrooms and made door mats to reduce the stacks! So maybe a rock wall stencil soon? It was great reading the stories behind the 1st 6 stencils. Congratulations on all your success!!! I love SG stencils and have many that I love using too! Such humble beginnings. I have that whole set! A wonderful story, I so enjoyed reading it and especially the important fact that you simply went with the flow instead of fighting it! A big reason your company has grown as much as it has I bet! way to go, MB! 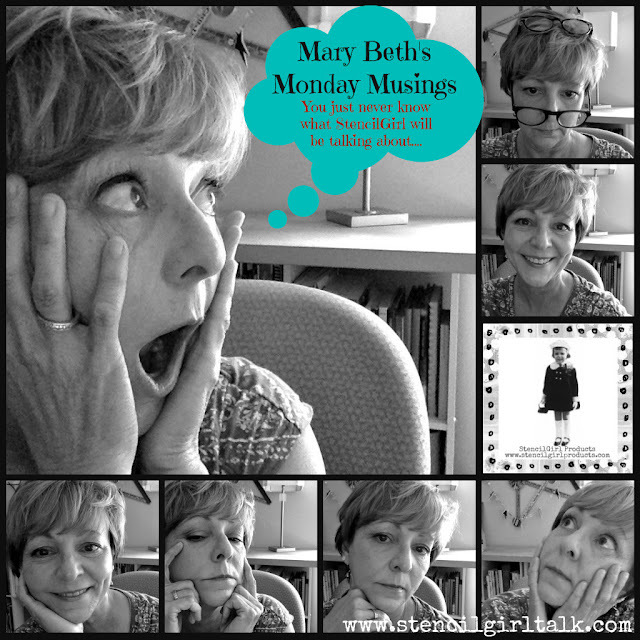 Love your blog post today, Mary Beth! It's like getting a behind-the-scenes peek into StencilGirl Products!! It is so great to read this backstory. I met you in 2010 at ArtFest when in a class taught by LK Ludwig, we used your stencils and immediately fell in love. Fast Forward to Vendor night. I was armed and prepared to purchase stencils. I am short and so as I moved to the table an actual hoard of artists swooped over me and purchased ALL the stencils. I must have had a crushed look on my face because you looked at me and said that I could order some from you which I did and you mailed them to me. A love affair with stencils and specifically StencilGirl was born. I am so proud of what has morphed into a very successful business. 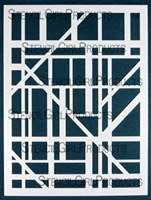 Wow--I had no idea I began my stencil adventure with the Stencil Girl "charter" stencils. My first purchase included all but the gears I believe. It was the wonderful Judy Wise who steered me your way during an online class. Still love those stencils! Thank you for following your heart! I have most of those stencils and never even realized they were the original designs. Cool to hear the story behind each one. Cool to hear about the "early years". You are one talented lady. A great journey, indeed. Congrats on 5 years! I understand your fascination with certain images; I am that way with compass roses. As someone who owns all 6 of these original stencils, thanks to a giveaway I won, I so appreciate you sharing how they came to be, Mary Beth. I was just playing with some of them today, too! Wishing you a happy 5th anniversary and many more years of success! Marybeth, thanks so much for sharing the "beginnings" with us! As I looked at the very first 6 , I had to giggle, because of my very first Stencil Girl stencils I ever purchased, I have 4 out of those 6!! Favorites for sure! Cool to know about the Rafters and the Gears! I can picture you at the window tracing- heehee Thanks for the giggle! Congratulations to you and your crew, and continued success for you! You are a genius! And you've just given me some new ideas about how I can use some of those stencils. Thank you! A great story of perseverance, creativity and success. That is a great story! Congrats on your success! 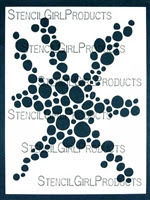 Stencilgirl rocks! They are all beautiful stencils! Great job and congratulations on 5 years of great stencils! I love reading about the "birth" of each stencil. Thank you for sharing. Each story was delightful, Mary Beth! Congratulations!